April 23, 2010 - The American Pixel Academy has just announced that Foundery Pictures and TechniCine will receive a platinum FEXY AWARD for the special effects in the opening sequence of WESLEY. 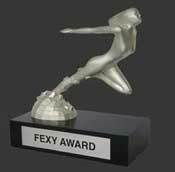 The Fexy Award is an industry award granted for excellence in the use of graphic effects in print, web, and motion pictures. The platinum award is the highest recognition. In awarding the recognition, the judges commented that the advanced CGI (computer generated graphics) and compositing work (in some sequences including as many as seventeen layers) represented "excellent effects that commanded the attention of the audience." The compositing work and post was accomplished by TechniCine, the special effects arm of Inspirata Films.